The vigil was held at the Buchanan Galleries steps at 4pm on Saturday. A vigil has been held in Glasgow to remember those who died in the Paris terror attacks. Organised on Facebook, the vigil took place at the Buchanan Galleries steps in the city centre at 4pm on Saturday. 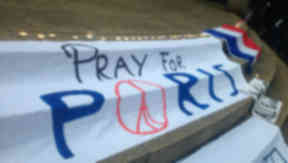 Those who attended displayed banners saying Pray For Paris and We Are All Parisiens. Liam Bruce, who set up the event, said: "We're asking people to bring flowers, candles, posters and anything they think appropriate." The series of attacks on Friday night killed nearly 130 people and wounded a further 180. The French national flag is flying at half-mast from Glasgow City Chambers, and will be projected on to the City of Glasgow College building on Saturday. In a statement, the lord provost of Glasgow Sadie Docherty and council leader Frank McAveety said: "France has always been a great friend to Scotland and Glasgow. "The victims of this outrage were ordinary people simply enjoying their lives, and this could have happened in any city in the world. All of the people of Paris are in our thoughts and prayers."